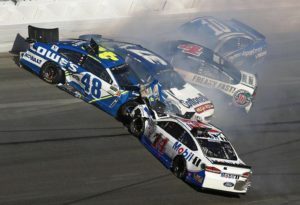 What do the Daytona 500 and I-4 Traffic have in common? Crashes. M any times we see patients who in “stop and go” traffic on I-4 in Orlando, FL have been involved in a car accident. A common scenario is that traffic comes to a halt and you stop your car but the person behind you isn’t quite paying attention until it is too late. This type of low speed collision does relatively little damage to the vehicles but can still have a big impact on your spine. The cervical spine (bones, ligaments, muscles, discs, nerves) are put together to protect that spinal cord as it distributes nerves to your body but ALSO to allow movement of you head independent of your body. It isn’t nearly as resistant to physical force and therefore only a fraction of the force is needed to create injury. Certain factors which increase the likelihood of injury include: 1. Size of vehicles (the bigger car wins), 2. Size of the neck (women and children are more likely to be injured, 3. Which way you’re looking during the accident, and 4. Ta da! How much damage there is to the vehicles. Have you ever watched a car crash during the Daytona 500 or even an indy car race? There are pieces of vehicle flying everywhere. It looks like (and is) the car was designed to come apart at the seams except for a small cage where the driver sits. The reason for this is that when a crash occurs, the energy of the impact can be absorbed by break away parts and also the crushing or metal. If the energy is not dispersed by those means then it will be transferred to the passengers of the vehicle. It seems counterintuitive but the damage to the vehicle is an important design idea that helps the passengers to not feel the force during the collision.